The province of Provence is the most popular part of the country among tourists and is famous for its stunning natural beauty and traditional charm. Lovers of luxury camping will be impressed by the rage of LUX-camps that can be found in this part of France and the excellent range of amenities that they offer. Why Should Visitors Arrange a Camping Holiday in Provence? Provence is famous for its colourful countryside, sunny weather, richly varied scenery and excellent food. This is the perfect place to discover the true essence of France is a relaxed and picturesque setting. Staying in a luxury tent is the perfect way to experience the true beauty and charm of this part of the country. This luxury camping site offers private access to a beautiful sandy beach, while a large lake and swimming pool can also be found on the site. Guests who want to explore the area will find that the city of Aix en Provence is within easy reach and bicycle hire is available at the site. Renting a bungalow tent at this large and lovely campsite is the perfect way to get back to nature while unwinding in style. As the name suggests, the site itself is set on the bank of an impressive lake that offers guests the chance to take part in a wide range of water sports, while several enchanting towns and villages are located nearby. Nature lovers are sure to be in their element when they rent a mobile home at Domaine du Verdon. The site features a picturesque alpine forest setting and is set close to some cool caves to explore, while the onsite water park is the perfect place to keep cool and have fun. 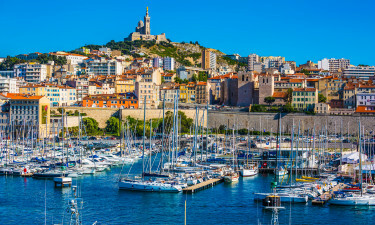 Part of the French Riviera is situated in Provence, which means that visitors will find numerous gorgeous sandy beaches to soak up the sun on. 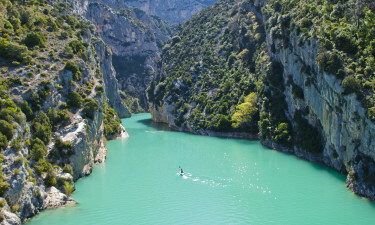 Travellers who can bear to tear themselves away from the beach will find that there are also plenty of other impressive nature features in the area, such as the gentle flowing River Rhone. The Lac de Saint Cassie is one of the largest lakes in France and is a perfect place to take part in a range of water sports, while excellent hiking trails can also be found running around the lake. The Maritime Alps can be found in the west of the region along the border with Italy and this area also presents the possibility for a range of outdoor activities. 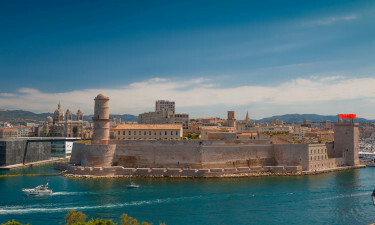 Marseille is the second largest city in France and boasts a beautiful harbour as well as narrow winding lanes running through the old town area. The city of Avignon is famous for its impressive 15th century palaces, while Aix-en-Provence is both the city of art and the city of water and is sure to enchant both culture vultures and nature lovers. 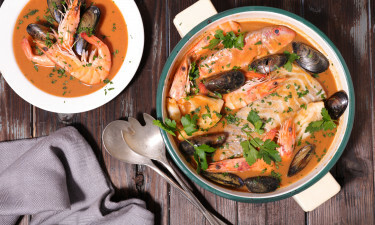 Provence is famous for its country-style cooking, with many of the region’s most famous dishes having been passed down from generation to generation. All use fresh local produce and ingredients such as wild mushrooms, pork, chicken and truffles. The wine from Provence is exceptional and a wide range of different types of wine are produced here, with Provencale rosé being the most popular. Most of the region features a Mediterranean climate that is characterised by hot and dry summers, winters that are mild with little snow and abundant sunshine all year round. This makes the area ideal for luxury camping at any time of the year as rainfall is usually light and infrequent.